To schedule an appointment you can contact designarchives@berkeley.edu or call 510.642.5124. Access to the Environmental Design Archives is by appointment only, the Research Room is open Monday-Thursday. Please note that some of our collections are stored off-site, advance notice is required. We are a small shop and prefer one to two weeks notice for scheduling research visits. Collections are organized by the creators of the records such as architect, landscape architect, firm, designer, or photographer and then by original client’s last name or project title not by address. Client name can be an individual (Robert Birge), corporate entity (Eichler Homes), or organization (U.S. Farm Security Administration). Information pages: found via the list of collections page consist of a webpage for each collection containing a brief biography of the creator of the records, and for each collection--the scope of contents, links to the project index and an online finding aid. Finding Aids: for individual collections are available to aid researchers in understanding the arrangement, scope, and contents of the records. They can be accessed through the EDA’s website or directly through the Online Archive of California where digital images are also available (see eyeball icon). Not sure what a finding aid is or how to use one? Take a look at our finding aid guide. Project Index: an excel spreadsheet that lists all the projects for a particular EDA collection. This index is organized by the original client's last name or project title and can be found on the information page for each respective collection. 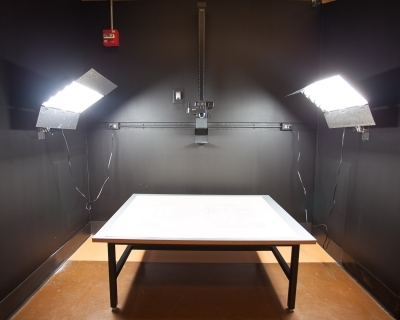 Holdings of the Environmental Design Archives are available to faculty, staff, students, and the public for research, within conditions imposed by donor agreements and institutional policy. Researchers are also required to comply with access rules designed to protect archival material for use by future generations. Researchers are required to complete a registration form and to furnish personal photographic identification, such as a valid driver's license, college or university identification, or an employer's identification card. The registration form includes a statement of agreement to abide by the Environmental Design Archives regulations, which researchers are required to read and sign before gaining access to collections. Stack areas are closed to the public. Materials cannot be removed from the Archives. Researchers are not allowed to take coats, briefcases, backpacks, handbags, books, etc., to the research tables. We provide an area for the storage of such items. No pens, food, or drinks, are permitted. Personal computers, cameras, and tape recorders may be used for taking notes provided that their use does not disturb other researchers. Use of such equipment is subject to approval by the staff. Scanners are not permitted. Access to collections does not constitute procurement of permission to publish, reproduce, exhibit, broadcast, or electronically disseminate Environmental Design Archives materials. Researchers must obtain permission for these activities by separate agreement with the Archives. Researchers are responsible for observing all U.S. and international copyright regulations. There is no research fee for students, faculty or staff of the University of California, Berkeley. An hourly research fee for using the collections is required for outside researchers. Reproduction, publication, and exhibition of images from the Archives are also subject to fees. See the EDA fee schedule.